Azerbaijani Laundromat to sully Bank’s reputation? The Compliance Advisor Ombudsman (CAO; the accountability mechanism of the International Financial Corporation [IFC], the World Bank’s private sector arm, and the Multilateral Investment Guarantee Agency [MIGA]) has accepted a complaint related to MIGA’s proposed $750 million guarantee of the Trans-Anatolian Pipeline (TANAP). The complaint, made by a former worker on the South Caucasus Pipeline (SCP), makes allegations of unsafe working conditions and unfair termination. The MIGA guarantee considers the SCP, which connects TANAP to Azerbaijan’s Shah Deniz gas fields via Georgia, an ‘associated facility’ under the MIGA guarantee, which means that it is covered by the CAO’s complaints procedures. Both pipelines form part of the larger Southern Gas Corridor (SGC), a mega-project, which, once completed, will transport gas from the Shah Deniz gas fields to Europe (see Observer Autumn 2017, Summer 2016). The complaint is the latest in a series of environmental and social concerns that have been raised about the SGC by civil society organisations (CSOs). In September 2017, US-based CSO Crude Accountability filed a complaint with the European Bank for Reconstruction and Development’s (EBRD) Project Compliance Mechanism (PCM) in relation to its loans for the Shah Deniz gas fields, documenting that four local communities had not been adequately informed or consulted during the project’s development. 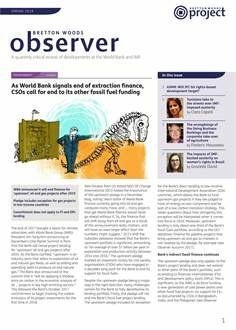 Despite claims that it is part of the EU’s ‘green transition’, the EU is yet to produce a robust climate assessment of the project, and a study published by European CSO network Bankwatch in January suggested that its carbon footprint could be worse than coal power when methane leakage is taken into consideration. Despite these concerns, TANAP has enjoyed significant support from the World Bank and other multilateral development banks. In addition to the proposed MIGA guarantee, the Bank approved $400 million loans to Turkey and Azerbaijan, respectively, in December 2016 to support TANAP’s construction (see Observer Winter 2017). The Asian Infrastructure Investment Bank (AIIB) and EBRD have also green-lighted $600 million and $500 million loans for TANAP, respectively, and the European Investment Bank (EIB) approved a €932 million loan for TANAP on 15 March.